Six cores of pure gaming sizzle. Disappointing battery life, but strong performance in a slim package. Six-core Intel CPU? Check. Nvidia GTX 1070 graphics? Affirmative. IPS panel with 144Hz refresh and G-Sync support? Sir, yes, sir. 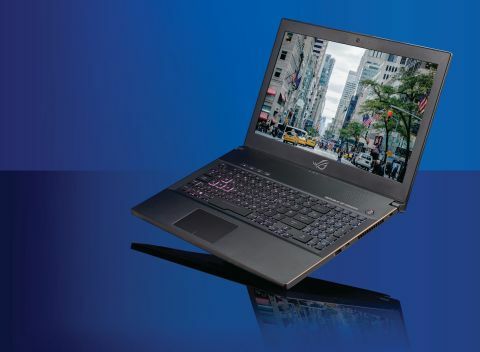 On paper, Asus’s latest ROG gaming laptop, the Zephyrus M, has all the makings of a high-frame-rate portable powerhouse. But like any laptop, what matters is the detailed implementation. Much more than desktops, integration and engineering make all the difference if you’re going to squeeze the maximum out of any given component in a gaming laptop. As it happens, attention to those details is precisely what Asus claims the Zephyrus M delivers. For instance, Asus says the thermal design of the chassis compared to its Zephyrus progenitor has been carefully tweaked. The overall thickness is maintained at 17.5–19.9mm, but the volumes have been optimized, and the number of thermal fin outlets has increased to four to improve heat dissipation. Similarly, the bottom of the chassis has a special heat-dissipating structure. When the screen lid is lifted, a section of the chassis bottom levers open to raise the entire laptop by 9mm, and allow air to flow through the keyboard and maximize circulation. Nice. Speaking of the keyboard, it’s fully RGB backlit, and offers 1.7mm of travel. Then there’s the 15.6-inch 1080p LCD panel, with claimed 3ms response, and the aforementioned high refresh and G-Sync capabilities, not to mention both a 512GB NVMe system drive and a 1TB SSHD for bulk storage. What’s more, Asus reckons this new portable offers an improved balance between performance and endurance, thanks to a bigger battery and Nvidia Optimus, which switches between the Intel integrated graphics and the Nvidia GPU on the fly. We could continue, but you get the idea. Whether it’s features or fine tuning, this thing has it in spades. But does that manage to translate into a great ownership experience? The performance picture is mostly very impressive. Asus has gone for the Core i7-8750H, one of Intel’s new six-core beasts. Under heavy multithreaded CPU loads, and as fitted to this chassis, it’ll run at around 3.9GHz for brief periods, before falling back to 3.3–3.4GHz during workloads such as sustained rendering. As for the Nvidia GTX 1070 GPU, we found it typically runs at just over 1700MHz with occasional dips into the 1600s. That’s true even after a full hour of gaming. Given the desktop GTX 1070 chipset has a 1733MHz maximum boost frequency, you’re clearly not giving up much versus a desktop rig with similar components. The exception involves extreme combined CPU and GPU loads. That can see the CPU clocking back to 2.7GHz. However, for gaming it’s unusual to see both GPU and CPU fully loaded at the same time. So, Asus has done a good job of managing the thermals, even if the area just above the keyboard does get very hot, and the fans kick out some serious noise under heavy loads. It was ever thus with high-performance gaming laptops. Anyway, physically this is a mostly pleasing portable, thanks to the high-quality chassis that uses plenty of metal, and a very solid-feeling keyboard. The downside involves the IPS LCD panel. The 144Hz refresh and G-Sync plus GTX 1070 graphics certainly make for a slick gaming experience. That’s especially true thanks to the 1080p native resolution. It’s a good match for the GPU power on offer if very high frame rates are the aim. But the panel itself isn’t particularly punchy, and it’s surrounded by an oversized bezel. This system is bulky for a 15-incher. Battery life is another weak area. Despite the ability to switch to integrated graphics, and the larger 55Whr battery, you’re looking at approximately 2.5–3 hours of video playback in practice. Long battery life isn't an expectation for a gaming laptop, but given the emphasis Asus has put on improving just that, it’s disappointing.